Begin the letter by clearly indicating your full official names, address including email as well as the date. On the right side of the letter indicate the name of the receiver, the name of the organization and date. Remember to use proper titles when writing your receiver’s name such as professor, ambassador etc. If you happen to know the receiver of your letter, use a specific salutation instead of the general “Sir/Madam” in your letter of acceptance. Clearly let your receiver know the purpose of your writing right from the start by precisely naming your subject line. 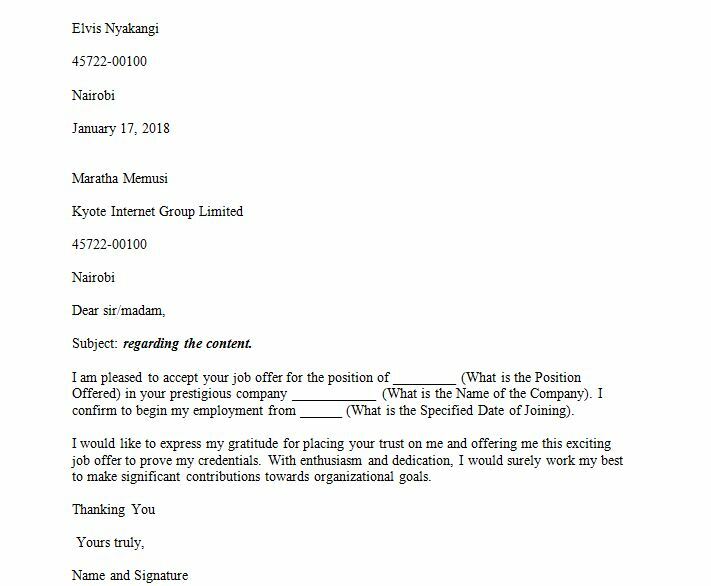 Start by introducing yourself in the first paragraph and go ahead to express your indicate your acceptance for the position awarded. Thank your receiver in your second paragraph of your letter of acceptance and let them know you appreciate their faith in you. You can also indicate you look forward to working with them in case it is a job offer. End your acceptance letter by signing off with your official name and signature. Use phrases such as “yours faithfully” and “Yours truly” instead of “Yours lovingly”.